This ecoregion embraces the lowlands and marine waters lying between the Cascades on the east and the coastal ranges on the west, from sea level to an elevation of about 1,000 feet, as well as the Strait of Juan de Fuca coastal plain west to the Twin Rivers mouth and the western end of the Columbia Gorge upriver to Cape Horn. Beyond Washington, the ecoregion extends north to include the Georgia Depression of southwestern British Columbia and south through Oregon's Willamette Valley. The Puget Trough marks the western shore of the former North Cascades microcontinent, which joined the North American continent some 50 million years ago. During the Pleistocene glaciation, ending about 10,000 years ago, the northern part of the ecoregion was deeply excavated by glacial action and depressed by the weight of mile-thick ice sheets, creating the basins and channels now occupied by the salt waters of Puget Sound and by many freshwater lakes. Soils are mostly recent glacial debris, thousands of feet deep in places. South of the Sound, from Tacoma and Olympia to Toledo, glacial outwash deposited large expanses of gravelly, fast-draining soils. Beyond the reach of the last glaciation, the lands still farther south are characterized by older alluvial soils, while the plains around Vancouver are composed of rich, deep silt resulting from repeated ice-age flooding of the Columbia River. Numerous large rivers flow down from the Cascades to Puget Sound, often forming extensive estuaries of which the Skagit, Stillaguamish, Snohomish, and Nisqually are among the least disturbed. The Chehalis River drains the part of the ecoregion immediately south of the Sound toward the Pacific Ocean, while the Cowlitz River and lesser streams drain the ecoregion's southern extremity to the Columbia. The ecoregion enjoys a temperate climate, moderated by maritime influence. Mean temperatures in Seattle and Vancouver are 39-40 degrees F in January, 65-66 degrees F in July. Precipitation is much influenced by the rain-shadow effect of the coastal ranges on the prevailing, moisture-laden southwest winds. Average annual precipitation ranges from 35-50 inches at or near sea level, rises to 60-80 inches in the Cascade foothills, but drops to 15-30 inches in the rain shadow of the high Olympics (northeast Olympic Peninsula, San Juan Islands, Whidbey Island). Precipitation is heaviest in the late-fall and winter months. Most years see one or two short bouts of snow, but usually no more than a few inches fall and do not persist. The original vegetation consists mostly of conifer-dominated forest of Douglas-fir, western hemlock, western red cedar, western white pine, and bigleaf maple. Typical understory plants include sword fern, salal, salmonberry, Cascade Oregon grape, snowberry, evergreen huckleberry, red elderberry, ocean spray, and vine maple. Red alder pioneers after fires or other disturbances. Madrone appears frequently in drier places and on coastal bluffs, and other heathers such as rhododendron and manzanita dominate areas with poor soil. Sites within the Olympic rain shadow and on fast-draining soils south of Puget Sound support prairies and dry forests of Douglas-fir, Garry oak, and lodgepole pine. 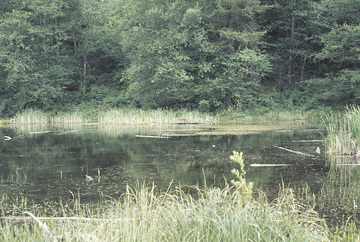 Willows, bigleaf maple, red alder, and black cottonwood dominate the ecoregion's riparian corridors and ring the many freshwater lakes, ponds, and marshes. Garry oak and Oregon ash become increasingly common farther south-e.g., on the Columbia River floodplain. Marine habitats include open water, brackish estuaries, salt marshes, tidal flats, and sandy and rocky shorelines, the latter found only in the northern part. Oceanic influence-strong on the broad, deep Strait of Juan de Fuca-diminishes progressively as one moves farther inland to the comparatively shallow, protected waters of the South Sound. The Puget Trough Ecoregion is a highly fragmented landscape. Over 70 percent of Washington's human population lives here, occupying just eight percent of the land area of the state. In addition, it is the state's busiest transportation corridor, both land and water. Much of the original vegetation has been obliterated by land clearing, agriculture, logging, road-building, and settlement. Dikes, dams, dredging, draining, filling, and reinforcement of stream banks and shorelines have greatly altered the natural hydrology. Almost no old-growth conifer forest survives; the remnants are in tiny patches. Fire suppression, snag removal, clear-cutting, and other industrial forestry practices have altered the natural succession of the still-forested landscape, leading to a monoculture of even-aged tree stands with low avian diversity. Over 95 percent of the prairies of the South Sound have given way to farming and suburban sprawl. Fire suppression has encouraged native trees and exotic plants to colonize what remains of this distinctive landscape.